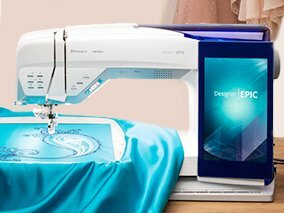 Whether you're sewing embroidering or quilting the DESIGNER EPIC™ top-of-the-line machine enable you to fulfill your greatest ideas. The first and only smart machine thoughtfully created for you! 12.2" sewing area from the needle to the body of the machine - which also means a wider hoop! The JoyOS Advisor - step-by-step tutorials that walk you through from installing an invisible zipper to embroidering appliques! Automatic needle threader - oh yes! It threads the needle with a push of a button! Okay, it is hard to stop at 5 favorite features because there are so many more! Come in for a demonstration today on the Designer Epic, and let us show you this wonderful machine.